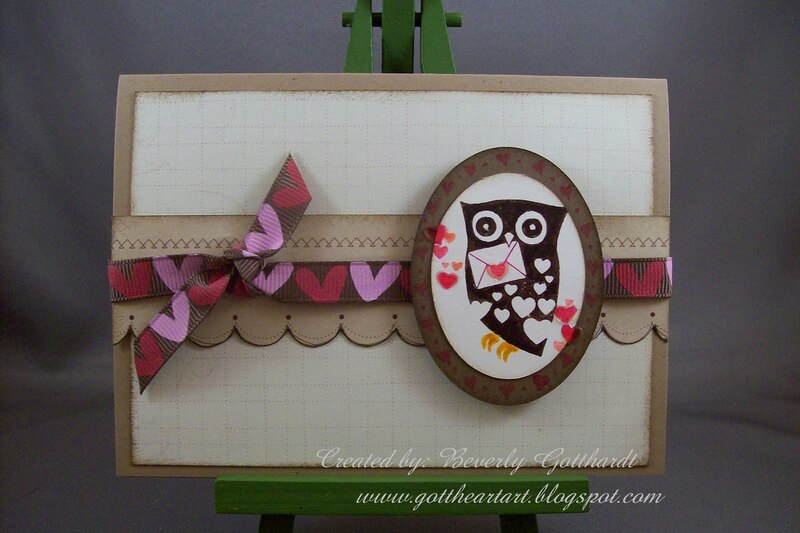 I've had this little owl stamp for a long while and never used it. So when I came upon the Tuesday Morning Sketches Challenge I thought, hmm. He would look really cute with this brown and pink ribbon, and I found this piece of paper in the DCWV Doodlin' Around Stack. It already had this scallop on it top and bottom, so I cute it apart and it was a perfect fit also. I colored the stamp with my Marvy Brush markers huffed on it to get all the colors damp again and stamped on Very Vanilla, after I cut the ovals I added the little heart bubbles over a few of the pink hearts just for some tactile appeal and doodled hearts and dots around the Soft Suede oval. Upon reflection, I should have doodled in a branch for the owl to sit on, but I guess we'll have to imagine him hovering to deliver this note. 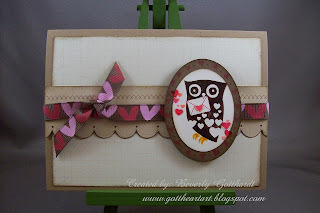 Supplies: Tan Card Blank 4" X 5 1/2" Halcraft, Papers: DCWV-Doodlin' Around Stack, Stampin Up-Very Vanilla, Stamp: Inkadinkado-Owl Note, Ink: Stampin Up-Soft Suede, Stampin Up marker-Soft Suede, Marvy Brush markers, Fiskars shape cutter template-Ovals-1, American Crafts-ribbon, pop dots. Very adorable card! I am so glad you decided to ink up that owl. Thanks for joining us at Tuesday Morning Sketches. Beverly, would you please email me at tuesdaymorningsketches@gmail.com whenever you have an extra minute. Thanks! Beverly, what a darling card. I love the owl.